BIAOH is proud to hold its Annual Membership Meeting. We will announce the election of the new Board of Trustees, provide information about how BIAOH is doing and more! This meeting is open to all BIAOH Members. Please contact Emily Smith at esmith@biaoh.org for RSVP and location information. Art on the Brain guides individuals living with brain/mind trauma (TBI, cancer, PTSD, stroke, etc. ), as well as their loved ones or caregivers, as they explore art across the disciplines. Art on the Brain focuses on building community and celebrating present and reemerging strengths. The program is free with registration required. Contact: Tracie McCambridge at (614)292-6982 or tmccambridge@wexarts.org for questions or to register. OhioHealth TBI Support Group Picnic: Thursday, September 13th, 2018, from 6-730PM. LOCATION: The TBI picnic will be held at Riverside hospital in the Green building back patio between endoscopy and admission/registration. Please park in the green or blue area and staff can direct you. Valet parking only available only in the blue lot. Please call the Dempsey Center 614-788-6115 with any questions. Please attend our annual picnic, where there will be lots of food, fun, games, and our speaker: Adam Snyder, an occupational therapist from OhioHealth Rehab Hospital, will present on yoga. Please bring a dessert, and please feel free to label/bring gluten-free and/or nut free, sugar free options for all attendees to partake! Looking forward to seeing you there! Join experts in stroke from The Ohio State University Wexner Medical Center and Mount Carmel Health System, along with national stroke authorities, for a comprehensive update on the latest advances in the diagnosis and treatment of complex stroke care. Join the Ohio Health Rehabilitation Hospital's cheer section at the Cap City Half Marathon! They will be cheering on the runners and holding up posters to raise brain injury awareness. Click here for a map of the course. Email Katherine Snook at KaSnook@ohiohealth-rehab.com for more information. Since its first Walmart Wellness Day event, the company has provided more than 2-million free screenings to people across the country, helping countless customers uncover existing health problems. For some, the screenings have been life-saving. Hundreds of thousands of Americans turn out for each Walmart Wellness Day event, making it America’s largest single-day health fair event. 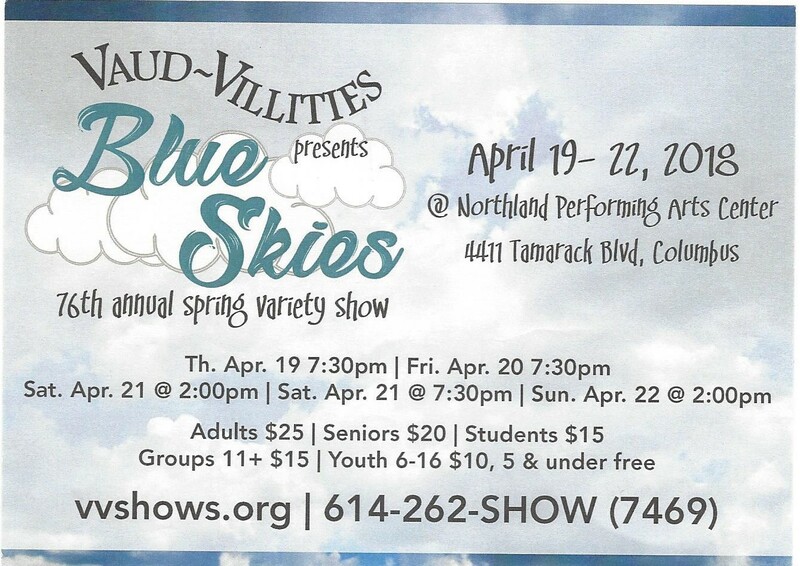 TBI Survivor, Thomas P. Wuichet will be performing in the Vaud-vilities Spring Variety Show on Thursday, April 19 through Sunday, April 22. Click here for more information about show dates and times. Click here for the ticket order form. Admission is $20. Click here for more information. BIAOH is proud to bring you the 2018 TBI Summit, Pathways To Recovery, It Takes More Than Luck! For more information please click here or see the 2018 TBI Summit link, located under "News & Events", above. The Dempsey Family Education and Resource Center is offering a Get Connected class. This 6 week, goal directed class is focused on helping individuals take charge of their mental and physical health. The class meets every Friday from 12:30pm-2:30pm and runs from January 19 through February 23rd. Please contact the Dempsey Center at (614) 788-6115 for more information.